Shikar tents are extremely beautiful and are properly furnished with all basic amenities that make them highly comfortable. These tents are made up of water resistant cotton canvas having wood block and screen prints. The attributes of our tents are water proof, durability and fire retardant. Our range of Shikar tents is available in various designs, shapes and colours and are fabricated using best quality raw materials and innovative techniques, which make them more reliable and highly durable. The Resort Shikar Tent offered by us is fabulous in designs along with beautiful exteriors. Aesthetically designed, these tents are perfect cottage and can easily be installed in the resorts. 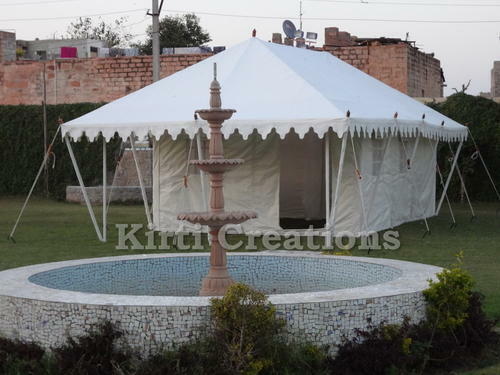 The royal white color fabric makes Resort Shikar Tents look elegant and sophisticated. Easy to assemble these are ideal for exclusive and standard parties.